Cheddar bacon muffins are the base of these festive ham sliders. 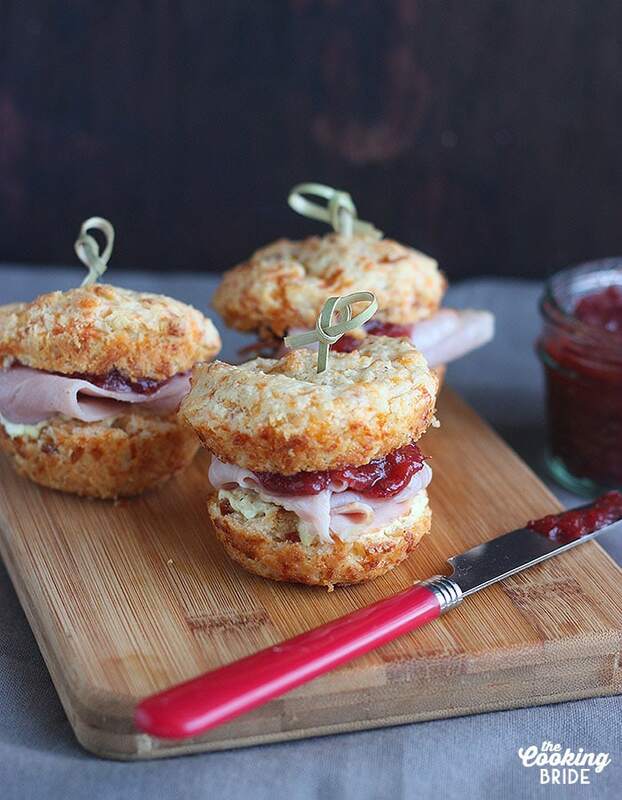 Salty ham is layered with creamy mustard cream cheese spread and spicy cranberry chutney. I’ve mentioned before that The Husband is an avid reader of Garden & Gun magazine. 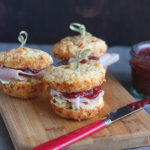 The front cover of their October / November featured these absolutely delectable ham sliders on biscuits laden with jelly. I flipped through that entire magazine over to cover at least three times searching for the recipe and never could find it. Why do that to me? I WANTED those sliders. But it looked like the only way I was going to get them was to come up with my own recipe. It was actually pretty simple. I have a pretty great cheddar bacon muffin recipe I modified a bit to use as the base. Then I layered a creamy mustard and cream cheese spread with salty smoked ham and topped the entire thing off with a festive sweet and spicy jalapeno cranberry chutney. 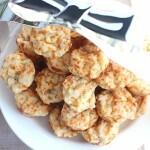 These little gems are perfect as a holiday appetizer or Christmas brunch. But don’t write these off once the holidays are over. 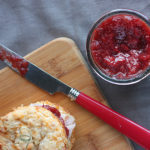 Substitute the cranberry chutney for strawberry jam an enjoy them all year long. In a medium mixing bowl, beat the cream cheese, mayonnaise, and spicy brown mustard until smooth. Set aside. Carefully slice each of the cheddar bacon muffins in half. Spread about one tablespoon of the mustard cream cheese spread across each muffin bottom. Layer one slice of ham over top. 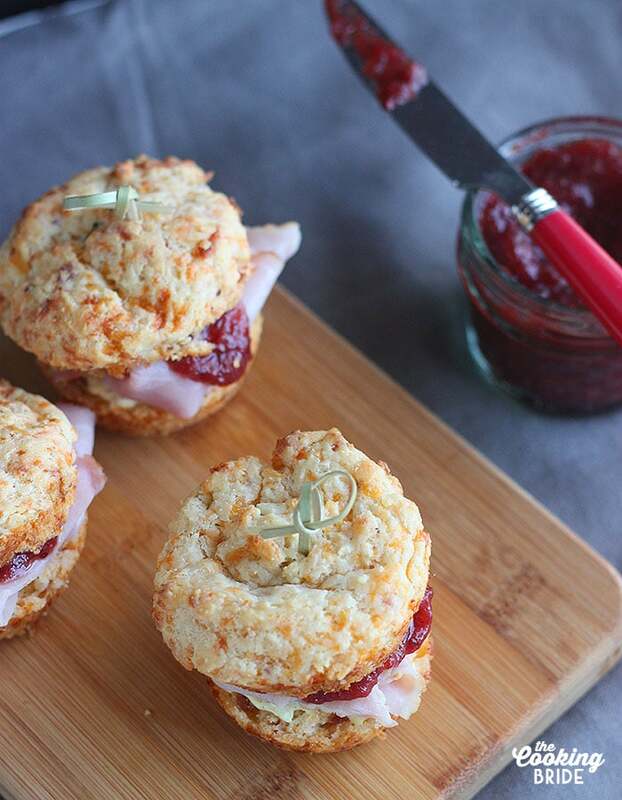 Spread one tablespoon of the spicy jalapeno cranberry chutney over the ham. Replace the muffin tops on the sandwich. Secure with a toothpick. Bake the cheddar bacon muffins in regular muffin pans rather than mini pans. Bake 20 minutes. I love this slider! Very creative! Oh wow these look tasty, what a delicious way to serve biscuits. This looks like fun, especially with cheddar biscuits. Thanks for the recipe! This is my dream flavour combination! This look dumb delish and easy to make. Would love to give this a try.